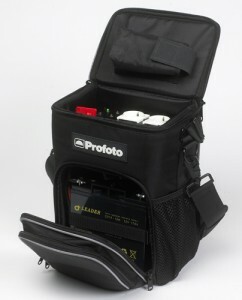 Profoto have made their own AC battery pack, the BatPac. We were right. Profoto have made their own AC battery pack, the BatPac. Now we can add another entry to the How much?! section of the Portable Power Guide. Expected in June. Rumoured price US$2000ish. Especially developed to power advanced flash equipment like Profoto D1 monolights, guarantees proper function and eliminates the risk to damage the flashes. Works with Profoto D1, ComPact and Acute2 flash equipment. But can be used for other electrical devices like chargers, wind machines, refrigerator boxes and constant light sources as well. One BatPac can drive up to 4 Profoto D1 (250Ws, 500Ws and 1000Ws), 2 Profoto ComPact (300Ws, 600Ws and 1200Ws) monolights or one Profoto Acute2 (1200Ws or 2400Ws) generator. Integrated heavy duty battery delivers up to 300 flashes with D1 1000Ws, 600 flashes with D1 500Ws, 1200 flashes with D1 250Ws etc. The BatPac is protected against overcharge, short circuit, high temperature and low input voltage. A ground fault circuit interrupter protects the user and all connected devices. A robust nylon transport bag is integral part of the BatPac. The carry handle, detachable shoulder strap and stowable harness makes it easy to maneuver the BatPac even if it is in use.